Hi Artsy Cajun readers! 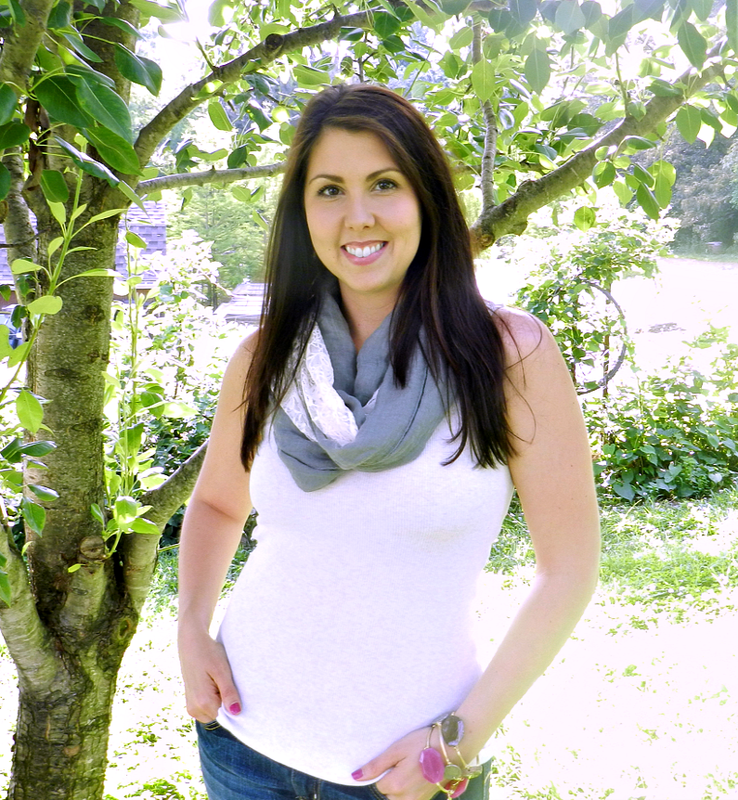 I'm Julie, and I'm the Kentucky gal behind the Homegrown State of Mind blog. I'm new to the blog world and absolutely love it! I'm a sucker for an easy, delicious drink recipe, so today I'm sharing one of my favorites, and just in time for Fourth of July celebrations - Fourth of July Wine Slushies! I hope you'll love them as much as I do! 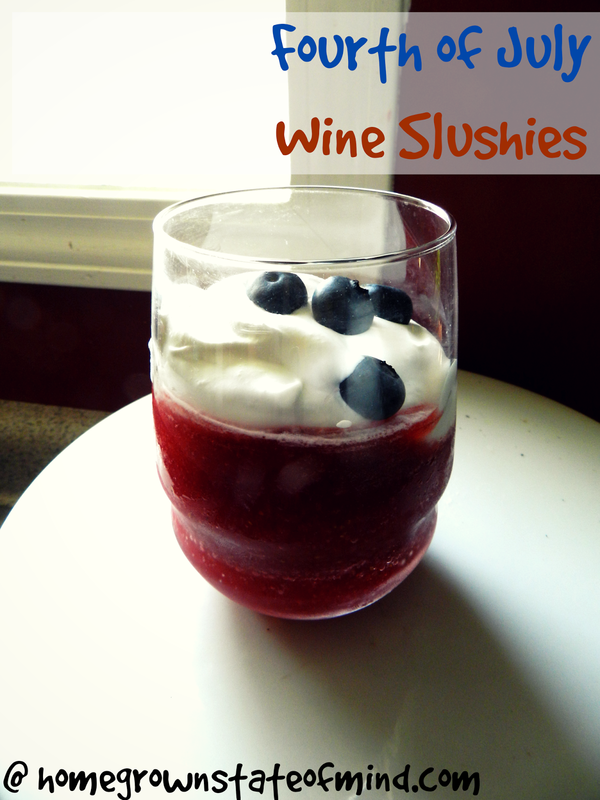 Last week while perusing Pinterest, I came across a pin about making wine slushies in an ice cream maker. Shut the front door! How did I not know this was possible?? I love wine slushies, as mentioned here. While the recipe I found sounded awesome, and easy, it has refined sugar added, which I try to avoid. So, I decided to try making this recipe more "clean." The result is unbelievably tasty - like, you would NEVER know there wasn't a bunch of sugar added. 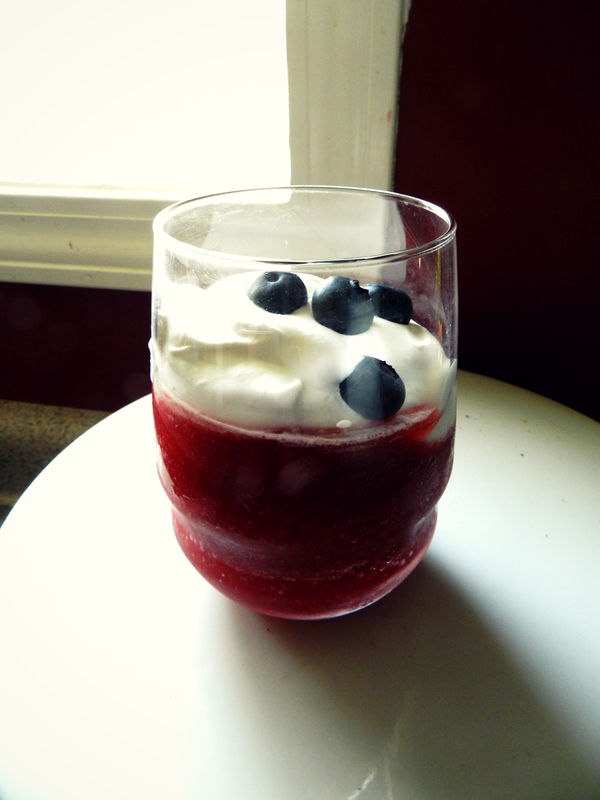 I present to you my Fourth of July Wine Slushie recipe - no added refined sugar, and topped with coconut whipped cream and blueberries. This is perfect for any upcoming Fourth of July celebrations! Of course, the main ingredient is WINE. I chose a red Moscato for this. I love any Moscato, but I didn't want to make this recipe too sweet, so I added red instead of regular. Any wine would work here. 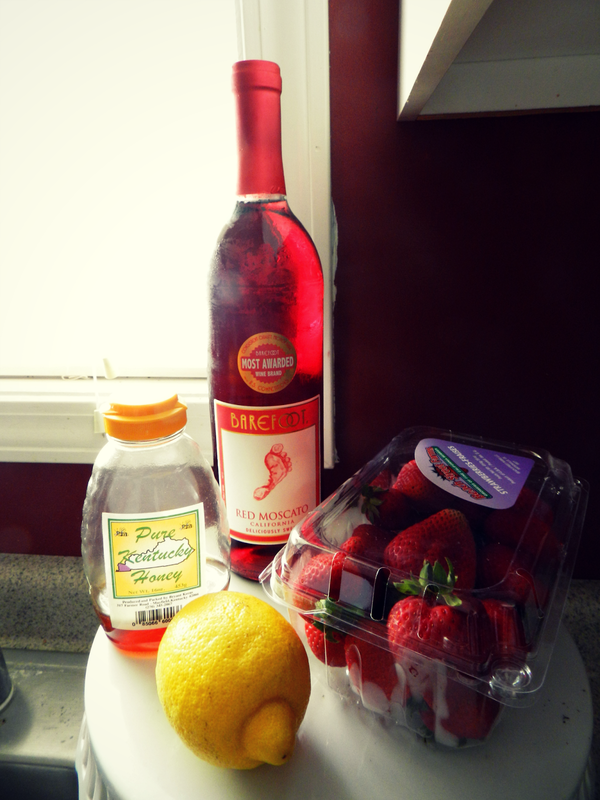 This recipe has 3 other ingredients, besides the wine - organic strawberries, local honey and organic lemon juice. That's it. If you desire toppings, you'll need blueberries, or any other fruit really (I'm thinking peaches would be delicious as well), and coconut whipped cream, or any regular/low-fat/sugar-free whipped cream. I made thiscoconut whipped cream from Oh She Glows. It's easy and the texture is exactly like regular whipped cream. 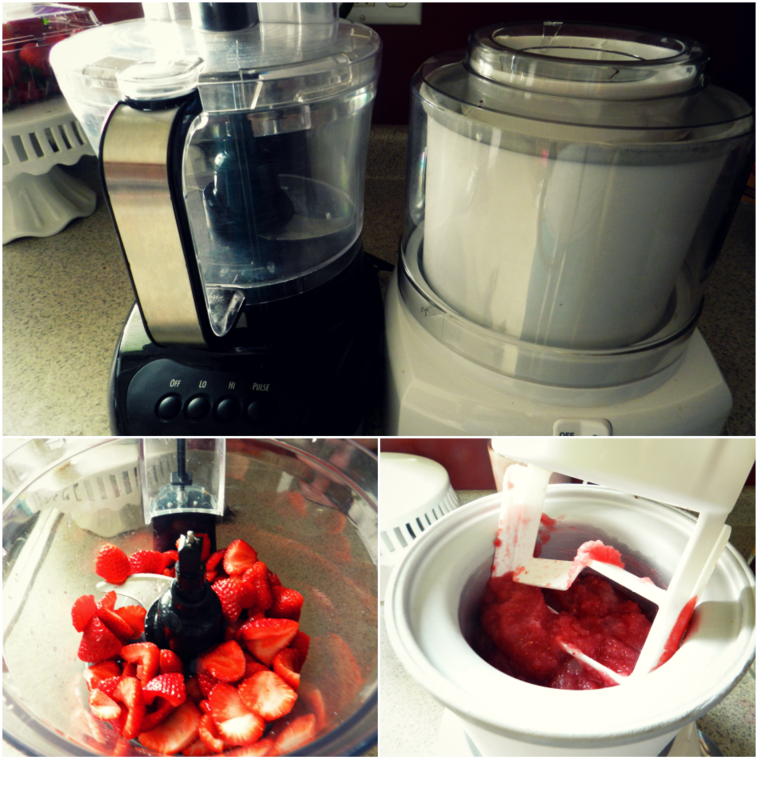 I used a food processor to turn the strawberries, honey, and lemon juice into a puree. A blender/juicer would work fine too. Do NOT add all of the wine to your food processor, unless it's a large-capacity model. It should all fit in a blender, however. Once strawberries, honey and lemon juice are pureed, pour it in the ice cream maker, add all of the wine, and let it churn for 25 to 30 minutes. Done. Then top it with whipped cream and fruit and enjoy! Place strawberries, honey, and lemon juice in a food processor (or blender) and blend until pureed. Add puree to ice cream maker, as well as whole bottle of wine. Let ice cream maker churn for 25 to 30 minutes, or until desired slushiness is obtained. Pour into glasses and top with coconut whipped cream (or regular whipped cream) and blueberries, or store in freezer until party time.